It's been called "Watergate on Wheels." It drew the attention of Walter Cronkite and the New York Times. It was a sports cheating scandal involving a child, and it's been an object of occasional fascination ever since, from newspaper articles to trivia questions to a television documentary. This summer, it turns 40. With the 76th Rally World Championship Soap Box Derby being held this weekend in Akron, Ohio, the Beacon-Journal today takes a look back at the infamous 1973 event. At the top of the AP photo shown above, that's 14-year-old Jimmy Gronen of Boulder, Colo., crossing the finish line first, just ahead of Brett Allen Yarborough of Elk Grove, Calif. But almost immediately, onlookers raised doubts about Gronen's green and white racer. People noticed the car had taken off a little too quickly at the start. Some later brought photos to race officials, who decided to inspect Gronen's car. X-rays revealed an electromagnet had been placed in the vehicle's nose. Eventually, the car was cut apart at a news conference for effect. Soon, the depth of the scam would be revealed. 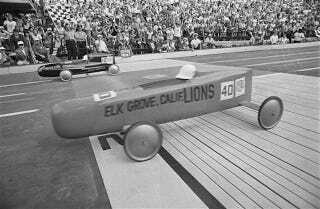 Soap box cars are supposed to rely on gravity and aerodynamics. But Gronen, on the advice of his uncle, Robert Lange, with whom he was staying at the time, had installed the electromagnet. The electromagnet was wired, and Gronen could activate it by pressing his helmet into the headrest. The effect gave the car a little push to get past the race's steel starting gate. “Anybody participating in derby races with eyes and ears would soon learn, as I did, that .... the Derby rules have been consistently and notoriously violated by some participants without censure or disqualifications,” Lange wrote to the Boulder Jaycees, sponsor of the Colorado race that sent Gronen to the All-American. Gronen echoed that in the book, Champions, Cheaters and Childhood Dreams: Memories of the Soap Box Derby, written by Melanie Payne, a former Beacon Journal business reporter. Gronen had to return the $7,500 college scholarship he won. But he destroyed his trophy and gave away the silk jacket he was awarded for winning. Lange agreed to pay a settlement to a boys club after the Boulder district attorney attempted to prosecute him. The Beacon-Journal managed to get a rare interview with Gronen, who has changed his last name. You should read it.